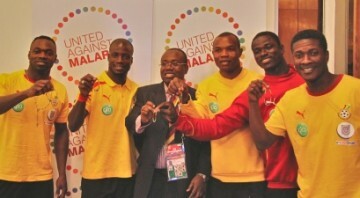 The Ghana FA has been using the United Against Malaria campaign as one of its social responsibility programmes with the senior national team the Black Stars, the Black Satellites, the Black Starlets and Black Maidens accentuating the need for a malaria-free society, urging the use of Insecticide Treated Mosquito Nets (ITNs) by Ghanaians. The Ghana Football Association kicked off a global campaign, United Against Malaria, aimed at reducing the prevalence of the deadly disease and completely halting it by 2014. In Ghana, statistics show that one in every five childhood deaths results from malaria. A collaboration between the FA and Ministry of Health, Malaria Control Programme and the John Hopkins University seeks to use sports, that's football, to campaign against malaria. This arrangement forms part of the millennium declaration which will use multi and inter-sectoral partnerships working together on an agreed plan to reduce death and illness due to malaria. The national football team of Ghana, the Black Stars, has won the Africa Cup of Nations four times , advanced to the finals of the 2010 Africa Cup of Nations and the quarter-finals of the 2010 FIFA World Cup, and participated in the 2012 Africa Cup of Nations among many other successes. In addition to success on the football field, the team has been busy raising awareness about the prevention and treatment of malaria, in partnership with Voices for a Malaria Free Future and the National Malaria Control Program. There were 3.2 million cases of malaria in Ghana in 2008, down from 8.3 million in 2006, thanks to a concerted effort from the Ghanaian government and its international partners. But the country has more work to do to end the preventable deaths from the disease. The Black Stars have appeared in public service announcements on behalf of the campaign to help raise public awareness in the country, and they have advocated to other teams and football federations at Africa's biggest sporting events. “Malaria has held back our country and our continent for far too long,” said Kwesi Nyantakyi, president of the Ghana Football Association in 2010. On behalf of the Black Stars, Nyantakyi received a Golden Boot at a UAM award ceremony where Awa Coll-Seck, executive director of the Roll Back Malaria Partnership, praised the team. “The Black Stars have wholeheartedly thrown themselves into the fight against malaria and this award is a small token of our collective appreciation of their efforts," she said. The National under 17 male soccer team, the Black Starlets and their female counterparts, the Black Maidens, have joined the malaria-free Ghana campaign, which is championing the use of Insecticide Treated Nets (ITNs). The campaign, which was started by the Black Stars, has seen the other national teams like the Black Starlets and Black Maidens joining in as the ambassadors of the nation in the United Against Malaria (UAM) campaign that uses football to promote effective prevention and treatment of malaria. Studies in Ghana had shown that malaria attack deprives pupils of four learning days. 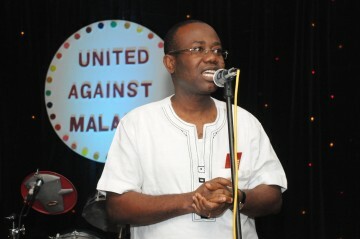 "The participation of the Starlets and the Maidens in the fight against malaria will motivate their peers to maintain effective malaria prevention behaviours such as the regular use of insecticide treated bed nets," Mr Emmanuel Fiagbey, Country Director of the Johns Hopkins University Centre for Communication Programmes, Voices for a Malaria-free Future Project, said when he presented long lasting insecticide treated nets to the two teams at the Ghanaman Football Centre at Prampram. Recalling the enthusiasm that the players and management of the GFA have demonstrated towards malaria control in Ghana, especially in the run-up to the South Africa World Cup, Mr Fiagbey called on the national under 17 players to exhibit same aptitude by ensuring that they use the nets and encourage their peers to do the same. He said the ITNs, which are deemed to be the cheapest yet the most effective and safest preventive tool against malaria would ensure that all players remain ever safe from malaria. Ghana's national football team, the Black Stars, are featured in this United Against Malaria cheer song, which was produced in part by the VOICES for a Malaria-Free Future project at the Johns Hopkins Bloomberg School of Public Health, Center for Communication Programs.